Inground swimming pools can add value and enjoyment to your property in the Mooresville or Lake Norman, NC area. Inground Swimming Pools in Mooresville – In the Mooresville & Lake Norman, North Carolina area, we experience very pleasant weather throughout most of the year. The average temperature between April and September is about 71 degrees, and we often have much higher temperatures than that during the warmer months. Therefore, inground swimming pools are great additions to residential properties in this area. On a warm summer day, one of the most pleasant activities is taking a cool dip in a pool. Inground swimming pools provide a great option for exercise, as well, if you are looking for ways to stay healthy without going too far from home. You can take the opportunity to teach your children about pool safety, which eliminates the concern of drowning or not knowing how to swim. A child who has taken an appropriate pool safety course can also teach these lifesaving skills to others, which can continue to keep children safe when they are around a swimming pool. You can also enlist the help of your children to keep the pool clean and well chlorinated, giving them responsibilities that help them become more resourceful. If you choose to add inground swimming pools to your property, you can host swimming parties and invite loved ones over to enjoy the cool and relaxing experience. You may also enjoy lounging next to the pool with a favorite magazine or book. An inground swimming pool will add a lot of value to your property, since many families enjoy swimming as a hobby or recreational activity. 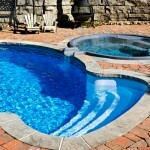 For more information about the benefits of inground swimming pools, contact us at Lake Norman Signature Pools & Patios. We build luxury pools for both residential and commercial properties in Mooresville, NC. At Lake Norman Signature Pools & Patios, we proudly install inground swimming pools in Mooresville, Cornelius, Davidson, Denver, Huntersville, and Lake Norman, North Carolina.